The Willows Care Home has been caring for older people for over twenty five years and has established an enviable reputation for excellent care. This has been achieved with its devoted manager and loyal dedicated staff. 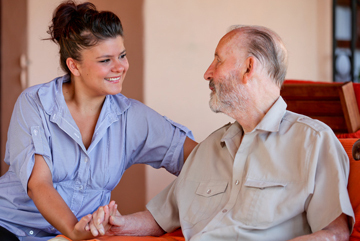 The home offers person centered care in a warm, homely, friendly and peaceful atmosphere. We provide personal and dementia care, respite care along with day care services for non residents . We offer all our residents excellent levels of care and support that is right for them. Our care services are tailored around each individual to meet their specific needs and requirements. At The Willows the staff are committed, they provide people with the support, care and encouragement they need. They tailor their approach to the individual needs. Families and friends are also encouraged to be involved in the home life as much as possible. We work as a partnership with both the residents and their families to build the trust and relationship that we will give their loved ones the upmost care. With The Willows being an independent care home, we are able to provide an individual service to each of our residents, allowing us to give plenty of personal attention to all residents around the clock. We are always looking for ways in which to improve The Willows, constantly listening to the feedback from our residents, their families and our own staff, making The Willows a truly superb care home in which to reside in.